Once upon a time there was a little chimney sweep, and his name was Tom. That is a short name, and you have heard it before, so you will not have much trouble remembering it. "A timeless Victorian tale of adversity, adventure, and triumph told in the original unabridged edition. Tom, a young chimney sweep, toils under the misery of his horrendous job and cruel boss, Grimes, until fairies turn him into a water-baby - an underwater sprite. Plunged into a fantastical world under the sea, Tom encounters many adventures and learns valuable lessons from all sorts of sea creatures including their rulers, Mrs. Bedonebyasyoudid and her sister, Mrs. Doasyouwouldbedoneby. Under their tutelage, Tom embarks on a daring rescue and regains his human form once again. Instantly popular upon its initial publication in 1863, The Water-Babies is at once a skillfully woven moral allegory and a bewitching childhood fantasy." The Water Babies is another of those interesting books that I picked up just by chance browsing. It's a not very well known nineteenth century children's tale, although apparently it was well received when it first came out. The Water Babies is pretty heavy on moral, but the writing is very readable, and the asides the author takes are generally not annoying but amusing, where he talks about the possible existence of water babies and other creatures, before dismissing it and saying, "Am I in earnest? Oh dear no. Don't you know that this is a fairy tale, and all fun and pretense; and that you are not to believe one word of it, even if it is true?" Which was very funny, and just as entertaining as the actual story sections. The writing was hardly dense at all, and I quickly read fifty or so pages once I got drawn into the story. I thought that the fact that The Water Babies talked about poverty and equality and kindness in the nineteenth century was really interesting and admirable. And then of course Kingsley has to spoil it by calling an Irish person a poor "Paddy" who knows no better and saying that they're all tricksters and no one is honest. Later, there's a foolish lobster who's from Ireland. He also insults the Welsh. Ah, 19th century hypocrisy, how I love thee. Tom himself is a chimney sweep before being transformed into a water baby, a job that as Jane Austen's England informed me, was awful. I don't know if fifty years alter the conditions were better, but I doubt it.The Water Babies did address some issues of equality and fair treatment, but then of course, it spreads more inequality. There was also a lot of racism in the book. At one point, Tom the water baby is talking to some salmon, which are big, well-bred fish in this novel, and they're talking about how the trout are inferior to them, so "ugly and brown" and so degraded in their tastes that they will eat salmon children. Then, the lady salmon adds, "Why, I have actually known one of them propose to a lady salmon, the little impudent little creature." That part (and the Irish insulting part) was where I started to realize that I wouldn't love The Water Babies, because while it does have some good advice, a lot of it is downright bad. Also, between pages 90 and 97, the book took a decidedly trippy turn with its description of the professor and his troubles brought on by the fairies. It was so weird; thankfully, it didn't last long. I feel like overall the quality of the book deteriorated as the book went on, with more and more needless anecdotes being added in, as if Kingsley was eager to make a certain word count or provide even more moralizing. There were some short side stories that were completely unnecessary, and those were annoying. At the beginning, the asides were fine. But they started getting progressively less interesting as the book went on. The book started out very well, but by the end it was a bit too much. There were too many lessons trying to be taught, and the story itself started getting really, really silly with the Mrs. Bedonebyasyoudid and Doasyouwouldbedoneby. It was kind of unnecessary. Look, kids get the morals without spelling it completely out. I still thought the book was okay, but I can also see why it's not read much these days. Children (and anyone, really) don't like to be told how to behave; it's human nature to want to do the very opposite, and while The Water Babies tries to illustrate good behavior through a drawn-out parable of sorts, it still feels a bit like Kingsley telling his readers how to act. Which is a strategy that doesn't work. Also, towards the end there were more Irish slurs and advocating of beating people (if they've done wrong). Still, I liked the writing, and the book wasn't awful. It was just prejudiced, and it got harder to ignore as the novel went on. 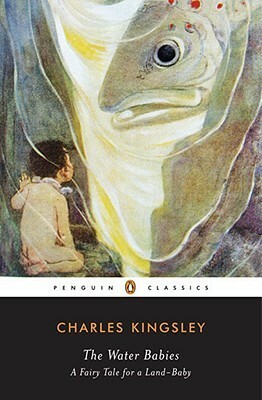 I think that while reading The Water Babies one should remember what Kingsley says twice in the book, which is not to believe a word of it, even if it is true (which it's not).